Guaranteed carpet & clothes Moths SW London: Moth removal treatments throughout SW London, Surrey & West Sussex. - Welcome to NMT Pest Control. We control bed bugs, moths, wasps, mice, mouse proofing, cockroaches, ants, flies, spiders and other unwelcome visitors. House Moth Control & Removal Treatments throughout London. Clothes Moth & Carpet Moth removal in London- The Moths that we are concerned with here and the pest varieties that eat carpet fibers and create holes in clothing, are small (1cm long or less) and brown or mottled. They are rarely seen flying around. Unlike there light seeking cousins, carpet and clothes moths prefer undisturbed, dark areas such as under sofas, in corners, under rugs, in wardrobes and other areas that are infrequently vacuumed. NMT Pest Control offer a comprehensive moth control treatment service to residential and commercial customers in London, Surrey and Sussex. We deal with carpet Moths, Clothes Moths, Indian meal/pantry Moths. We have appointment slots available throughout the week in London. We also work on bank holidays & weekends. We can often treat the moth infestation problem on the same/next day. Moth Removal - We have several moth removal treatments, all of them specially designed for moth infestations at different areas of a property. NMT Pest controls moth remedial treatments encompass wood and tiled flooring insecticide sprays, Long term insecticidal carpet treatments, Flying insect knockdown ULV treatments & full house residual treatments. Our comprehensive moth removal and control treatments come with a no quibble guarantee that we will eradicate any London moth control infestation, or will return free of charge and perform our treatments again. Small brown Moths (approx 1cm long, rarely seen flying around unless disturbed) on clothing or on or under rugs and carpets. Holes in wool, silk, cotton clothing. 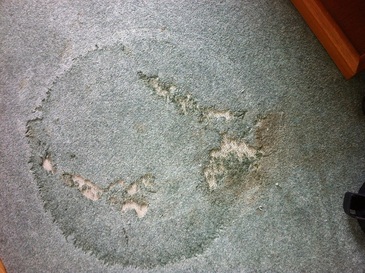 Bare patches on the carpet especially in corners and under furniture. small moth cases, usually 1cm long and often found in damaged areas. Contact NMT pest control at the first signs of Moth activit,y as Moths can cause a considerable amount of damage to Clothes, upholstery and carpets if left untreated. Pest moth lavae have expensive tastes and cause damage when they eat natural fibers found in wool carpets, silk clothing and rugs and wool.